SuperSponge – From SpongePedia, the biggest SpongeBob-wiki in the world! 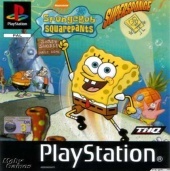 SuperSponge is a SpongeBob sidescroller game that was released in 2001 for PlayStation and Game Boy Advance. This game is available with the SpongeBob, Nicktoons, Fairly Oddparents, and Rocket Power GBA 4 Pack. Collecting spatulas in the PS1 version is similar to collecting rings in Sonic the Hedgehog. This page was last modified on 5 May 2015, at 20:15.